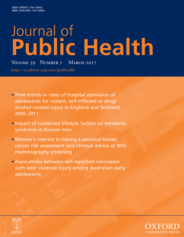 The Journal of Public Health invites submission of papers on any aspect of public health research and practice. The journal aims to promote the highest standards of public health practice internationally through the timely communication of current, best scientific evidence. The problem of obesity: it has persisted despite global efforts to reverse it. We all hear regular news reports about it, about how prevalence rates globally remain stubbornly high, about how this factor and that factor cause it, and about government strategies to address it. And still, it proves a puzzle yet to be solved. Ten years ago in the United Kingdom, the Foresight Obesity System Map report described factors evidenced to cause obesity and their interrelationships, in what is one of the most detailed mapping of such a complex health issue. It identified factors across society, from individual biological and psychological factors to distal social and infrastructural influences, and included a thirteen component stress subsystem. Recent research reflects some of this range of aetiological factors that influence childhood obesity. Global perspectives from countries of study including Brazil, Australia, England, South Africa, China, and a review of the international literature cover topics frequently reported by the media, like the food environment, unhealthy food advertising policy, weight management interventions, and associations with gender and sleep. Lesser known research areas include the developmental origins of obesity, which examines how foetal conditions in utero can influence the amount of fat deposited on the body in childhood and adulthood. This field of research provides the kind of evidence used to justify a public health approach to obesity, with a focus on prevention in early life. Another important area of public health research, but again perhaps lesser known, is the roles of schools and parents, given the tendency for policy approaches to involve schools and communities in prevention. While the Foresight Obesity System Map helped to shift thinking about obesity as an energy imbalance, to an issue that is complex and underpinned by inequalities, there has not been the expected depth of research on the ‘whole system’ of obesity. Systems thinking takes into account the context of public health problems; considers the various levels on which public health can be addressed (local, regional, national and international); and seeks to engage a range of sectors that can play a vital role in transforming the whole of society (health, education, housing, leisure, and so on).The tendency in many national policies is to ‘drift’ back to changing lifestyles by continuing to approach obesity with downstream, micro-level behaviour change initiatives. In general, these approaches are not effective at preventing non-communicable diseases including obesity at a population level and might generate weight stigma, thereby possibly perpetuating further weight gain. Given the incredible resistance of obesity to current approaches, more out-of-the-box thinking is required. New approaches to public health are required and have been discussed in the literature as part of the shift to the third era of population health, which focuses on optimising health and wellbeing. For example, a recent study highlighted the most pressing issues facing many African American communities, including inadequate housing, unemployment, familial stress and violence. The authors argue that placing too much emphasis on obesity as a priority area can ‘get in the way’ of solutions that could actually make a difference to people’s health and communities, given the wider forces known to cause it, with obesity being affected as a collateral benefit. To say the future of our children and young people is uncertain would be an understatement. The global health and political landscapes of the early 21st century present many challenges. Widening inequalities, global economic recession, global warming, insecure employment, rising debt and housing prices, and cuts to social benefits threaten the future prospects of children and young people and will undoubtedly shape their future health needs. We are already seeing rises in mental health issues amongst children and young people, such as self-harm and suicide, which is thought to be associated with stress resulting from such uncertainties, bullying and increasing exam pressures. We also know those with severe mental disorders, such as schizophrenia and bipolar disorders, are more likely to be obese. The wide-ranging global challenges we face also threaten the health systems that seek to support children and young people’s health holistically. Given the increasing complexity of health issues, as observed in the case of childhood obesity, systems thinking is needed to ensure that in such times of uncertainty an integrated health and social care systems can be developed, afforded, and sustained. Featured image credit: Donut by BootstrapGiver. CC0 public domain via Pixabay. Dr Emily Henderson is a medical anthropologist with a particular interest in the intersections between inequalities, stress and public health issues, holding expertise in obesity and mental health in children and young people. She recently carried out a four year Research Fellowship in Complex Health Systems at Durham University’s Centre for Public Policy and Health, a World Health Organization Collaborating Centre on Complex Health Systems Research, Knowledge and Action. She is a WHO trainer for the WHO’s Social Determinants of Health 'Health in All Policies' approach, and is also a Principle Investigator on the Complex Systems Research Programme at Fuse, the Centre for Translational Research in Public Health, one of five UKCRC Centres for Excellence in Public Health. Currently she is undertaking a one year secondment as the Children and Young People’s Mental Health Lead, Northern England Clinical Network, and is an Honorary Senior Research Associate at Newcastle University. I am very concerned about the future of our children. The modern way of life is very far from the one that is inherent in us genetically. Hence, there are a lot of problems with physical and mental health.